Brigadier General Ryan T. Okahara serves as the Chief of Staff and Commander, Hawaii Air National Guard, Honolulu, Hawaii. As the Commander, General Okahara is responsible for strategic planning and oversight of over 2,300 military members in the 154th Wing comprised of three flying squadrons, an active air defense squadron, an intelligence squadron associated with the National Security Agency, an air traffic control squadron and two combat communications squadrons. He is also responsible for an air and space operations group integrated with the 613th Air Operations Center. General Okahara is dual-hatted as the Air National Guard Assistant to the Commander, 14th Air Force, Vandenberg Air Force Base, California. 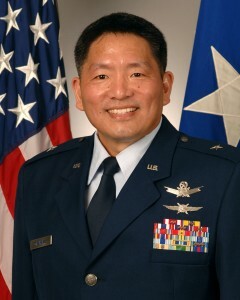 General Okahara received a regular commission in May 1990 as a distinguished graduate from the Air Force Reserve Officer Training Corps program at the University of Hawaii at Manoa. While on active duty, he completed Undergraduate Space Training at Lowery Air Force Base, Colorado and Space Operations Combat Crew Training at Peterson Air Force Base, Colorado in 1991. He served in Air Force Space Command until he resigned his regular commission and left active duty in 1996. Upon leaving active duty, General Okahara entered the Air Force Reserve as an individual mobilization augmentee at Headquarters Air Force Space Command and also augmented the Air Force Reserve Operations Readiness and Plans Directorate in the Pentagon to provide space expertise. commanded the 154th Mission Support Group, 154th Wing, Hawaii Air National Guard, lauded as the largest and most diverse wing in the Air National Guard. From July 2012 to January 2013, General Okahara deployed in support of Operation ENDURING FEEDOM and Combined Joint Task Force-Horn of Africa as the Director of Staff, 379th Air Expeditionary Wing. He served as the principal assistant, advisor and spokesperson for the one-star wing commander of the largest wing in the Central Command combat theatre and provided support to more than 8,500 Air Force, joint and coalition forces and 25 tenant units including the forward headquarters for Central Command and Special Operations Command. He directed over 120 wing staff to coordinate all actions with the Host Nation, Air Force Central Command and Headquarters Air Force and managed time-sensitive action with rotational manpower.